Karen Turner has done it again! In her first book All That and Everything, a compilation of short stories, she did not disappoint. In Torn she has managed to once again take her readers on an emotional roller coaster that invites, intrigues and has you riveted to the pages. The year is 1808. Alexandra and her siblings are happy, until mother returns with child due in 5 months and a man whom it is announced she is soon to marry. Lord Thorn’s children soon join them. Alexandra is a wild child who likes nothing better than to climb a tree and loose herself amongst the gardens of Broughton Hall. Her wild child attitude and strong will only continue as she matures, causing her to disapprove of her arranged marriage and fight against her mothers will. Alexandra finds love within her own family, a love that must be kept from her mother but a love that her step brother Patrick feels for her. Torn speaks of lust, love, passion, turmoil and heartache. Torn had me holding my breath in anticipation and intrigue from paragraph one. Karen Turner has a way of weaving an eerie magic into her writing. A magic that engulfs you. These few sentences, words of wonderment and intrigue, greet you as you open to the first page of your journey into Torn. Immediately I was wondering who this old woman was and why her sleep was disturbed, but my questions were soon forgotten as I became at one with the book and my thoughts no longer mattered. All that mattered at that moment in time was the turning of the pages and the world within. Karen Turner knows just how much to give. She has the art of knowing just when and where to stop in her description, plot and character life so as to keep her readers hanging, turning pages and wanting more. It is rare I turn to the back of the book to find out what happens but with Torn I just had to cheat. The impulse, the need to know and the desire for all to be ok for the two main lovers was way more than I could bare. Again Karen got me. Turn to the back page I may but alas the answer was not there. Still needing to know I turned back page after page, skimmed words and hunted until I found what I was looking for. Going back to where I was I still wanted more. As I read Torn I grew up with Alexandra. I cried tears of happiness for her love, felt her pain and sadness, mourned her loss, became angry at her mother and disliked her betrothed. My emotions flowed faster than I could turn the pages. 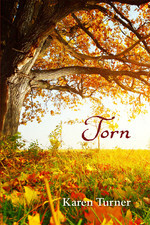 Torn is a story of love, passion, courtship and family betrayal that pulls at your heartstrings. At times I would lift my head from a page and have to regroup with 2013 after having been in the 1800’s for so long.I closed the cover of Torn in disbelief. I wanted to yell at Karen Turner. How can she do this to me. Leave me not really knowing. Leave me in limbo until the continuation of the story in her next book Inviolate. I will admit it, I emailed Karen. I asked and asked and asked, actually begged is probably more the word, for the answers to my questions. I know she knows what happens, she is the author after all, but like all authors Karen loves to keep us in suspense. My last request. Hurry up will you! I need Inviolate, NOW! sit amongst the Autumn leaves, under the tree and loose myself in the pages.